Noah, my neighbor is studying journalism, he wanted to interview me last week and write a piece about me and Semantic Saturation on his blog. Thank you Noah, I wish you the best of luck in your studies; and after reading the article you wrote I can already tell you are on the right track. Shant Hagopian, syrian rock superstar! “He’s obsessed with Pink Floyd,” told me Shant Hagopian’s wife as I noticed a painting made out of guitar picks of the legendary guitarist David Gilmour of the band “Pink Floyd.” My walk here from home was under 1 minute, I live across the street. As I sat on the couch and asked his wife, Nanor, a few questions, she served me a glass of water. After a few minutes of finding out about how they met and what their first date paintballing was like, Shant came upstairs from his hard work looking exactly like what you would think a metal guitarist would look like. From the long hair and scruffy beard to the casual t-shirt and jeans, this guy says rock’n’roll from head to toe. We had a small chat about his life and career as a musician. 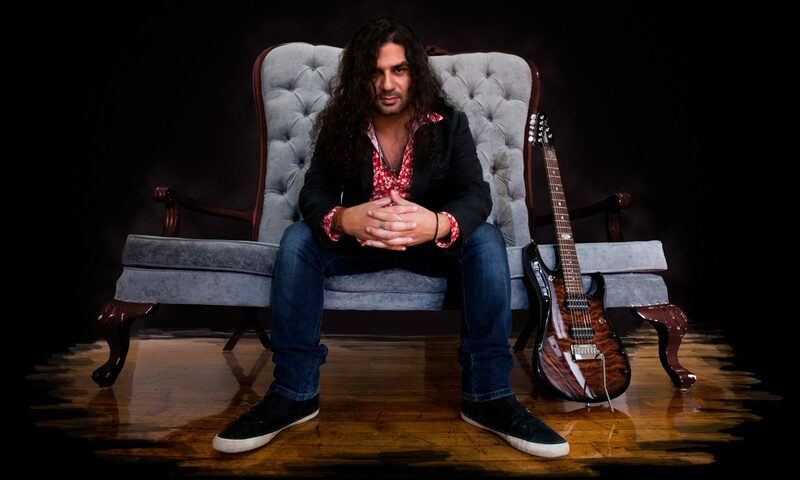 It all started because of bands like Bon Jovi, Aerosmith and Pink Floyd that Shant got into the rock world and began playing guitar at the age of 15 later going to music school. “Semantic Saturation” and “Solipsistic”, two names I found extremely fascinating after he explained to me what they meant. “Semantic Saturation”, was the term used to describe the moment when you say a word over and over until it begins to lose meaning and starts being funny. The choice of the album name was a reflection of how the media causes us to become desensitized to the events revolving around us. Considering all the shocking things happening in Syria it’s easy to see why he would pick the name. “Solipsistic” on the other hand is the theory in which only you exist and everything and everybody around you is an illusion created simply for you. He chose the name, because it reflected the way he worked, he was reaching out to all these people through the Internet and it felt as though he was the only real person in his music-making world. Look at the album artwork and you’ll see a girl representing “the listener” facing a metropolis of fake buildings, facades are what you see and with incredible detail you’ll notice some construction workers building everything for no one but her . Open up the CD pack and you get a 360 view of this “false reality” the girl is seeing. After reading the reviews of the album it seems as though the album was quite a success especially since I did not notice a single trace of negative criticism. Getting to know Shant was great and I could truly say that this guy is the definition of cool.His laidback attitude and the detailed description of his life allowed for the opportunity to see how much he must have worked hard for what he’s accomplished. I did an interview recently on the Swedish metal blog of Robex Lundgren. What made you call the band “Semantic Saturation”? Semantic Saturation also known as ‘Semantic Satiation’ is a psychological phenomenon where repetition causes a word or phrase to lose its meaning temporarily; words are then processed in the mind as meaningless sounds. The idea is much deeper than that, and it doesn’t just stop there. Even though unapparent, but our brains are being saturated on a daily basis, and fed by multiple sources, they may look slow but the effects are the same on the long run. Derek is an inspiration, being a Dream Theater fan since 1995 “A Change of Seasons” was the first album I had, and up till now it’s still my favorite track (let’s call it a long track). Andy Kuntz is the most amazing, down to earth, very supportive and friendly musician I have ever met, add to that his amazing voice and the writing and producing talents he has. As for Virgil and Ric, it was natural to have them on the album. Derek Virgil and Ric worked together before with Planet X, they are simply virtuosos, they are all top of the line musicians, they are world class progressive rock gurus, and how can you go wrong? Virgil was even one of the seven drummers who were auditioned to be the next Dream Theater drummer after Mike Portnoy left the band. DT picked Mangini, their loss is my gain. Keyboardist Derek Sherinian, drummer Virgil Donati and bassist Ric Fierabracci are long time pals since they all played together with Planet X. Andy Kuntz is the vocalist and front-man of the German prog metal band Vanden Plas. And I’m the founder of Semantic Saturation, former guitarist of prog/power metal band Nu.Clear.Dawn from Syria. Where was your first gig?/Where was the latest gig? Semantic Saturation remains as a studio project for the moment. The anatomy and nature of this project doesn’t allow me to organize and perform live shows since all the members involved in this project are extremely busy with their own bands, touring or writing and recording new music. Who writes your songs?/ who writes the music who writes lyrics? As you may know, the debut album Solipsistic is mostly instrumental, except for the last piece “What if We All Stop” which has Andy Kuntz on vocals. The music is mainly written, arranged and produced by myself, except a couple of tracks were produced by Derek and Andy. The lyrics for “What if We All Stop” were written by me and Andy. Andy also helped me arrange the music for the same track to accommodate the vocal lines. What’s good/bad with the band?/What genre do you feel you are? I don’t think there’s anything bad with the band, and lots of good things, starting with the musicianship and ending with the music. Semantic Saturation is a progressive rock/metal. The debut album is Solipsistic, consisting of eight instrumental pieces and one song with vocals. Total length of 51 minutes. No official music videos yet, but there’s one promotional video for Stardust, the fourth track from the album. I’m 34. I’d say Pink Floyd and Dream Theater are the main bands that got me into playing music and becoming a musician. Ironically, as a child I wasn’t interested in music that much until my teenage years, when I started listening to rock and metal, I discovered Pink Floyd through my friends and then a couple of years later when I started listening to heavier music I discovered Dream Theater. I was about 15 years old when I picked up a classical nylon string guitar, later on I joined a music school for jazz guitar studies, and graduated in 2003. Work on the debut album Solipsistic started late 2010, and took almost 2 years to complete. Witch band is the best you´ve seen? If you’re referring to the best band I’ve seen live on stage, I’ll answer as what was the best show or performance instead of band. I think one of the best and unforgettable experiences I’ve had was one of the Porcupine Tree shows I’ve seen, the place was small and intimate, the sound was amazing, the track-list was amazing and the band’s performance was best. Another experience would be Roger Waters’ latest The Wall tour. That is historical. I’m currently planning to put together a music video with some friends. Whether this will be 100% possible or not I am not sure as of yet. Later in 2014 there are plans to start work on the next masterpiece. Probably a mix of both, older bands are the schools, but modern bands give you the energy and latest hype. Like I mentioned, Pink Floyd and Dream Theater are a big influence and inspiration but sometimes it could be a book I’m reading, a movie, or even an article on the web. Writing a catchy theme. That’s the basis of my music writing process, if the theme is not memorable; as complicated as it may be, it will not stick in the listener’s head. In fact the simpler the theme, the more catchy and memorable it will be. I have said this many times before and I will keep saying it: Music is art, not a competition. Downloading is fine as long as the artist is profiting from it. I think the real music fan will go ahead and purchase the album even if they have downloaded it for free. In this age of the internet it’s almost impossible to stop what’s happening, but it’s possible to adapt. I listen mainly to prog bands, Porcupine Tree, Pink Floyd, Rush, Dream Theater, Ayreon, Anneke Van Giersbergen, Pain of Salvation the list is pretty much endless. But also who doesn’t enjoy some blues or jazz by the fire with some alcohol? I haven’t played on stage for a while, but when I did the most I feared was having technical problems, and not giving what the audience is there for. I’m the former guitarist of Nu.Clear.Dawn, the prog metal band from Syria. The band toured and played a lot of shows in the region including one giant metal festival in Istanbul, Turkey back in 2004 among big names like Pain of Salvation, Epica, Vanden Plas, UDO, Amon Amarth, right after releasing the full length studio album “Poem of a Knight” which was officially the first metal album released in Syria. That would’ve been very depressing. Why would we live then? Absolutely the most important. In the end, they are the engine; they are who I make music for. How often do you rehearse? Where do you rehearse? Not much lately, since I’m pretty busy promoting the album, as you know I pretty much try to do everything myself. I usually play/record in my humble home studio, which I am planning to expand and convert to a cozier and an even more professional guitarist corner. Name 2 of your own songs you like at the moment? Stardust and… Believe me the second one is harder to choose, but I think Ambivalence, the opening track is the one. It portrays my personality very well. What drives a band that isn’t all that famous and renowned to try to make a living on their music and to keep playing? The devoted fans and my love for the genre. How do you view the music industry today? With the internet, smaller and new starting bands have a lot more chances to get heard today versus how things worked back before the internet existed. It’s not the guys in suits who pick the bands we want to listen to anymore, it’s the fans who choose. Artists and musicians today can also make more money instead of having a small percentage of the profit share, providing they do things the right away, and that starts with their music. I’d like to thank you for your interest in Semantic Saturation and thank you for the interview and opportunity to have more people listen to the music we have made. Rock on! Earlier last week I asked everyone to post any questions they have for me, and I promised to answer as much as I can. So I made the video below with all the answers for you guys. Ken, my friend from Inhale The Heavy; I apologize. Apparently I missed the question you posted on my blog, due to the high level of spam comments I get on the blog (very frustrating). But I will answer your question right here right now. Hey Shant, It’s Ken from Inhale the Heavy. I’m a huge fan of your work and a your band Semantic Saturation. I was wondering if there will be a follow up to the debut, ‘Solipsistic’, and are you currently working on any other projects.? There will definitely be a follow up, with the same musicians? perhaps not. I’m not yet working on any new material, cause we currently have plans a to make a music video for one of the tracks from Solipsistic (can’t say which one yet). I will start writing new material after the video release, and hopefully get these brilliant musicians I have in mind to feature on my next work. Sylvain Rodrigue asked on Facebook: I have a good idea, but what is the meaning of Semantic’s album cover? Sylvain, sorry couldn’t include the answer in the video. I always keep asking questions on the Facebook page. But I thought why not have you ask any questions you have this time, and I’ll try to post a video response with all the answers later this week. Think of it as a personal interview with me.